Teknic Sprint Jacket. Three layer jacket includes mesh base jacket, textile zip-on outer layer and zip-in thermal liner. Very good condition except for some pilling on interior lower right and left sides of jacket that does not affect functionality See photo of right hand side. Pilling on left is much less). We never carried this model in our store, so I don’t have a link to provide for reference. This is a classic “jacket in a jacket” design. The outer jacket is solid textile and the inner is mesh, so you can use this in a wide range of weather and temperatures. Overall condition is good. Just a little grimy around the collar, but that could be easily cleaned if it bothers you. The seller has put on a fair price. The sizing is about right for a 46 chest jacket, or men’s XL. Might even work for somebody a touch bigger. About the Customer’s Closet: Our Customer’s Closet is new to our site. 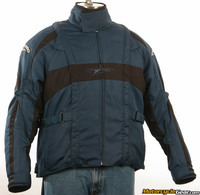 It is a great place for customers to sell their unwanted motorcycle apparel items. It’s easy… just provide a few pictures and a description to sell and we’ll take care of the rest. Buying is just as easy. Ready to sell? Want to know more? Go here for details. Special Terms for Customer’s Closet Items: Products sold in this department are not “new”. The products and their descriptions/pictures are submitted by customers and/or vendors and are not professional in nature. As part of the selling process we visually inspect each item to verify what you see here, but ultimately the warranty offered is limited to your option to return the item for store credit or refund within 30 days of ordering (under our normal terms of sale). Return shipping is the buyer’s responsibility. These products carry no factory warranty.